TripAdvisor recently rolled out an improved site and app experience – making it easier for travelers to access the information they need to find and book the right property at the right price. The newest version of the TripAdvisor API (v8) includes enhancements and new functionality that will improve the way we surface content, increase performance and help drive more bookings. The new API will allow us to break down taxes, fees and base rates enabling us to display the most compelling price for each market. Upgrading to the new API will help your hotel partners stay competitive and attract bookings from travelers looking for the lowest price. We’ve merged the hotel and booking availability calls by adding parameters that specify requirements for your response. This will allow us to include room and rate features such as cancellation and refund policies, bed configuration and amenities earlier in the booking flow, which can motivate potential guests to book with your hotel partners over competitors. This update to the Instant Booking API (v7) helps to capture rich room and hotel information that enhances the traveler's decision-making and booking experience, standardizes the presentation of content across the site, and improves conversion rates. Room, Rate, RoomRate are now separate objects, allowing for standardization of room and rate content. 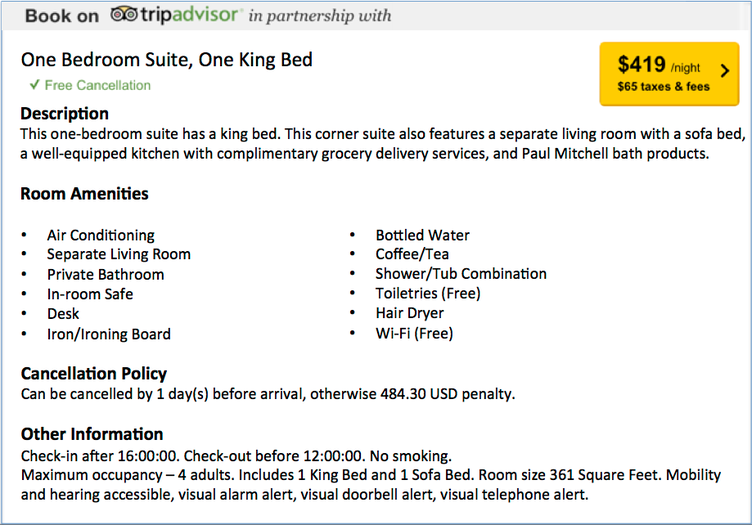 A new Supported Amenities page lists out Open Travel Alliance codes for fields such as bed configuration, room details, and amenities. Cancellation policy has been moved from DetailedRoomType (API v5) to the new RatePlan object (v7). We have added additional hotel and rate level information for child, pet, accessibility, meals, and smoking policies. "room_size_value" will replace "room_size". We require "room_size_value" to be an integer. "accessibility_features" will replace "accessibility". This new object provides standard accessibility options used by several Partners, allows a coded list that helps with international rollouts. Partners have the opportunity to retrieve details on instant booking and TripConnect CPC campaign adoption for the properties in their inventory. This API enables connectivity partners to retrieve a listing of campaign details for each mapped location. Additional details can be found in the TripConnect Campaign Data API page. New functionality has been added to the /booking_submit message which provides travelers with the ability to send free text special requests or comments to the hotel. This field will not be enabled in the UI until TripAdvisor has verified the implementation is working correctly. The documentation has been updated to provide clarification on how the refundable field in the /booking_availability message should be determined. New functionality has been added to the /booking_availability message which provides details to the travelers on the datetime when it is no longer free to cancel a reservation. Additional details can be found in the Room Types Object section. New functionality has been added to the to the /booking_availability message which provides details to the travelers on how many rooms are remaining when availability is limited. The documentation has been updated with a minor change to the examples to show the CustomerSupport object. This has been added to the examples for booking_availability, booking_submit, booking_verify, booking_cancel API calls. The documentation has been updated to reflect more clearly that the 'price' field in the AvailabilityRoomType object must be the price of the entire stay. To verify connectivity works appropriately with non-test properties, TripAdvisor has added an additional step to the certification process - Alpha testing. During this stage bookings will be made for real hotels (1-5 pilot hotels provided by partners) in the production environment. Please note that Certification (and listing on the Connectivity Partners page) is only available on sucessful completion of this Alpha Testing. (19 Nov 2014) accepted_credit_cards required in /booking_availability response. TripAdvisor requires a credit card at time of booking not only to support a hotel’s guarantee policy but also to reduce fraud. In the case where a hotel does not require a credit card guarantee, it will be up to the partner to either pass or not pass the credit card details to the hotel. If the hotel does not support a credit card at the time of booking, please return a shortened list of the standard supported types (MasterCard, Visa). This parameter had been incorrectly marked as [Optional] previously. The Problems array was originally marked as [Optional] for the /booking_submit and /booking_verify message as it did not need to be returned for a "Success" response but was needed in the case of a "Failure." The documentation has now been upated to reflect this. TripAdvisor will now be using a new IATA number (22502174) for Instant Booking reservations. To ensure your hotels have the correct information, please update this information and notify your hotels if required. To minimize the impact of any future changes, the TripConnect Instant Booking /booking_submit API will be updated to include the IATA number. The documentation will be updated once the API has been updated. In the interests of providing the best experience for our customers, TripAdvisor has made a slight change to the /booking_availability method to require that the hotel_details object be returned in the response. Previously this object was marked optional.